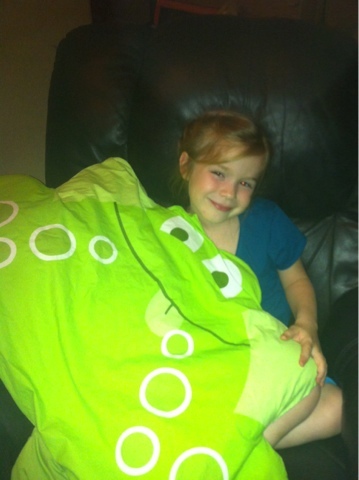 A couple months ago, we received this adorable frog Pillow Friend in the mail from The Company Kids. Lydia thought it was so cute, and we immediately found a pillow to stuff into the pillowcase. It's been a companion ever since, and is her favorite snuggle buddy when she's hanging out in the living room watching TV. Lydia (5 years old) says, "It's really comfy and you can put it behind your back when sitting in a chair. It's perfect for when you're tired and want to relax. Plus, it's sooooo cute! If you are taking a car trip, it's a great to take along"
The pillowcase is well made, and I really like the fact that there is a hidden zipper that keeps the pillow inside. They have a few other styles, like monkeys, dogs, cats and even a butterfly. A regular bed pillow fits perfectly inside, and it is easily machine washable. I think they would make cute gifts, especially with the holidays coming soon. You can find Pillow Friends, and many other cute room decor items at The Company Kids website -- www.thecompanystore.com. What an adorable idea! Thanks for always sharing the best products, would love to surprise my daughter with this for Christmas.